Polar's M430 smartwatch for runners has GPS and wirst-based heart rate sensors - AndroGuider | One Stop For The Techy You! Finnish-based fitness wearable maker Polar has introduced its latest smartwatch called M430, aimed at runners. It is equipped with Polar’s proprietary 6-LEDs wrist-based heart rate technology and GPS and offers personalized adaptive training guidance as tools for runners to reach their personal best. The Polar M430 is fully waterproof and sports a lightweight, breathable wristband, and offers vibration alerts to inform runners when they reach their goals during training. It can also track steps, distance, calories burned and sleep, as well as display notifications from your phone. The smartwatch features Black-and-White display, 8MB flash memory and is backed by 240mAh battery, which promises up to eight hours of run time with GPS and optical heart rate on, up to 30 hours when using the low-powered GPS and up to 20 days of normal usage. It is compatible with devices running Android and iOS. There's also a dedicated app called Polar Flow that provides personalized feedback, adaptive training plan and live guidance for athletes during various stages of their training sessions. It also comes with Polar's Running Program and Smart Coaching features. 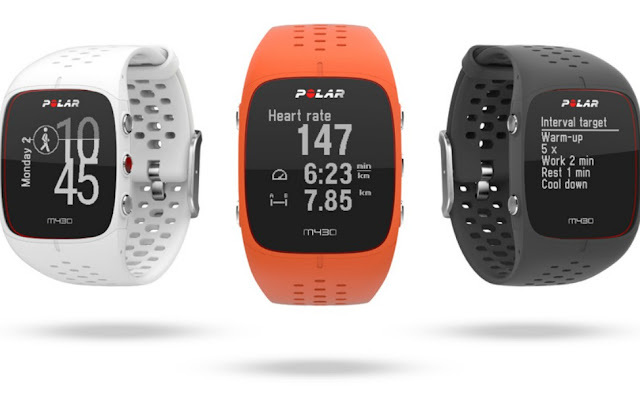 The Polar M430 is priced at $229/€229 (Rs. 14,800) and starts shipping in May. It comes in Dark Grey, White and Orange colors.